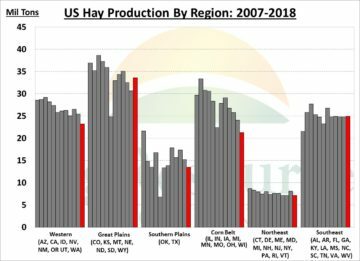 US Hay Production Down in 2017 on Lower Yields: US hay production peaked in the late ’90s and has been in steady decline since, particularly in the Corn Belt. Midwest livestock herds have declined, and the profits of competing crops have easily bid away marginally productive acres. However, tighter budgets last year saw another increase in hay acres, especially across the Great Plains States. Yields also improved and production rose 9% in the Great Plains states. Elsewhere in the country, production was unchanged in the Southeast and declined in every other region. 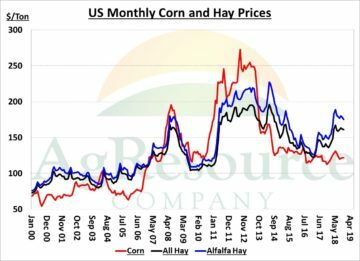 Producers in the Cornbelt bailed 2.7 Mil fewer tons (-11%), production in the S Plains fell 1.7 Mil tons (-11%), and there was 2.3 Mil tons (-9%) less bailed in the Western US States. Last week’s Annual Crop Production Summary report from NASS showed that the US produced 123.6 Mil tons of hay in 2018, a year over year decline of 4% – the 2nd consecutive annual decline. Excluding the 2012 drought, it was the lowest hay production figure since 1976! Total hay acres on a national basis increased fractionally from 2017; however, yields fell 4% and pulled production down. 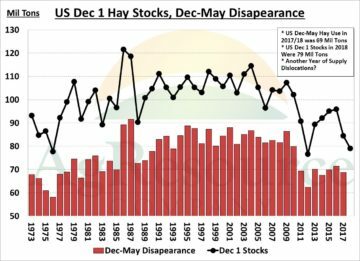 Additionally, NASS reported 2018 Dec 1st all hay stocks were just above the 2012 low at 79 Mil tons. The red bars on the chart reflects Dec-May hay disappearance, which has been historically low since 2010. A year, Dec-May hay disappearance totaled 69 Mil tons. A similar usage rate this year would put May 1st hay stocks at a record low 10 Mil tons. Livestock feeders in the west, are reporting increased hay demand needs due to winter storms that started back in November, and have restricted winter pasturing.